Praise the heavens, I’m back! I’m slowly coming out of the sick cave after the past eight days so it feels really good to be back in my kitchen; back into my old routine. First it started with Matt getting a head cold and then I came down with something real nasty that just would not quit. I’m telling you, not being bound to the couch, with energy and the ability to breath, is the greatest gift this week and I immediately did what any reasonable person would do: Make Red White and Blue Dessert Nachos. And I made a how-to video. Well, come on now, I’m behind on all my July 4th and summer-themed creations, I had to make up for lost time! Cut the Flatout pizza crusts into star shapes with the larger cookie cutter. I got around 10 pieces per crust. Place on a parchment paper-lined baking sheet. Brush the star cut outs with olive oil on both sides and in a small bowl, lightly dip and coat the stars with the cinnamon sugar. Bake for 10-12 minutes or until just browned. Allow to cool completely to firm up. Cut two sides of each strawberry to fit into the mini cookie cutter star shape. Chop up the remainder of the strawberry into small bits. Cut the raspberries and white nectarine into small bits as well. Mix together all fruit along with the blueberries. Place the star-shaped cinnamon chips onto two separate plates. Divide half of the fruit per plate and add a big dollop of dairy free yogurt. Drizzle with melted chocolate. Devour. 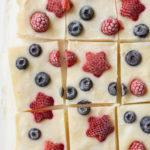 Put a healthier spin on your kids’ dessert options this summer with these 4th of July-themed Red White and Blue Dessert Nachos. Freshly baked Flatout cinnamon sugar chips topped with fresh fruit and several dollops of your favorite dairy free yogurt of choice. This post has been sponsored by Flatout Bread. All opinions and text are completely my own.